I'm new to your blog, but I'm in love with it! So many great tips. I am starting the budget envelopes this week and with christmas around the croner im wondering how you budget for christmas gifts? We have a very large extended family which usually involves some types of gift exchanges at each gathering ( 5 in all…good grief!!) Any tips would be greatly appreciated. Thank You, Dana M.
Thanks for the Q's, Heather and Dana! HERE'S all about my personal budget, and how I track my spending. HERE's how much I recommend spending on gifts and Christmas. HERE's how we keep track of our money on our bank accounts. You need to take all three of these into account, especially the cooking part. We often times think to set aside money for gifts and travel, but hosting guests and cooking a Thanksgiving dinner require money too! You will most likely need a “holiday budget” for November, December, and maybe one other month that requires travel (your summer family vacation, for example). If it's a holiday that requires gifts, decide how many people you are buying gifts for, and how much you budget to spend on each person (range suggestion HERE). Calculate your travel expenses as accurately as possible, taking into affect inflating gas prices. Plan your holiday meal in advance (in a general way) and try your best to calculate the cost of cooking that meal. (See HERE for how I save 1/2 on my groceries without coupons). Once you've added up that Holiday's budget, try to be conservative and consider cutting 10% or 20% off the top of that budget so you are forced to be wise and frugal with your spending this season. 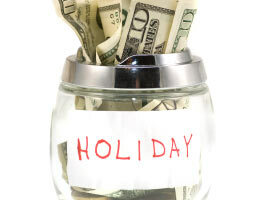 Now that you know how much your budget is for each holiday, how do you set that money aside throughout the year? Turn it into a monthly budget. 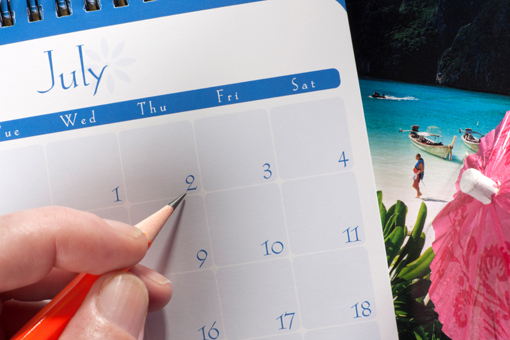 Take the total budget for each of those holidays, add them together, and divide the total by 12 (12 months in a year). You should set aside that budget each month, as if you were paying a monthly bill. 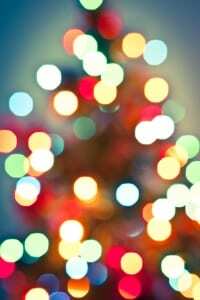 That way, when the holiday comes you have the money already set aside and you have been chipping away at that budgeted amount all year…instead of it smacking you in the face when the holiday sneaks up on you. You should automatically draft this money aside into your Family Regular Savings Account each month. See HERE for great detail…but your FRSA is an account that you use to save up for anticipated expenses. This is NOT an account you should pull money from often; but it's a holding tank for you to transfer money to regularly in anticipation of upcoming large expenses. Note: Not all holidays are the same. Thanksgiving won't cost you as much as Christmas most likely, because you don't give gifts at Thanksgiving. So when the time comes you need to really keep track of how much that SPECIFIC holiday budget is, even though you have extra money set aside for ALL the holidays. 3. Spend that budget wisely. You can purchase them HERE in our etsy shop, or you can make your own! Start early. Way early. My favorite time of year to buy gifts to last me all year…is right after Christmas! Stores are looking to get rid of inventory as the new year approaches, so keep your eyes peeled for good deals all year long, even right after Christmas. Just be sure to keep track of what you buy and have an exact person in mind or else the gift could go to waste. Gifts are NOT NEEDED for every holiday! You should train yourself to work celebrating of holidays into your standard monthly budget. In our family we give Christmas, birthday, and maybe anniversary gifts. That's it. No easter gifts for the kids (aside from eggs and candy), no Valentine's gifts (we go on a nice date or make gifts for each other). Really, you do NOT need to be buying extravagant gifts for every holiday. You can't take that stuff with you, people! Since my son is now almost 3, we tend to drive anywhere that is 12 hours or less, when it's all of us, for 5 days or more. When we fly, we tend to fly Southwest because it's cheapest around here. Jet Blue has good deals too, we just love that bags fly free with Southwest. Check out THIS post that gives you tips on finding tickets for cheap. Check out THIS post about rental cars. Check out THIS post on how we survive 12+ hour drives with two babies. Check out THIS post and THIS post on examples of how we save when on vacation; whether staying with family or staying in a hotel. Get creative with gifts. It's inevitable…the less money you are able to spend on a gift, the more thoughtful and creative you have to be…which equates in better gifts! Check out THIS post for a few examples on how I saved on Valentine's day gifts. 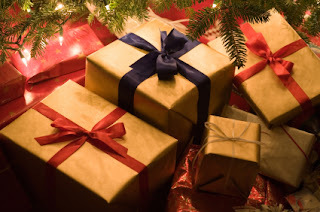 Click HERE to see my “gift idea” posts. Enlist help. Every year we gather in either Arizona, Oregon, Utah (our house), or California for Thanksgiving or Christmas. Each person visiting that person is assigned a responsibility for the holiday dinner, even if they are from out of town. Divide the food responsibilities so it alleviates a little cost. Hey, there are grocery stores everywhere, let them buy one component of dinner and cook it in your kitchen! It's very easy for someone to run to Costco and buy a Pumpkin Pie, or buy a bag of potatoes and make the mashed potatoes for dinner. Don't feel bad asking people to help contribute when you are the host/hostess! 4. Track spending very closely and spend wisely when that holiday comes. Brought to you by our friends at Couponcodes4u.com. Check out their awesome vacation giveaway HERE, but you'd better hurry, it ends on Nov 9th!! 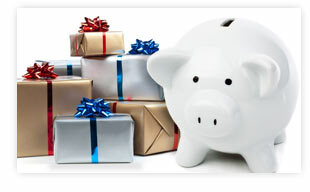 How do you feel about a separate Christmas club account a a means of budgeting ahead for Christmas?